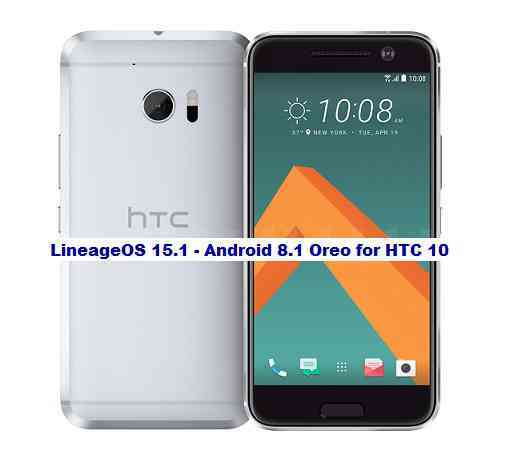 Android Oreo 8.1 ROM, LineageOS 15.1 for HTC 10 has now arrived via an UNOFFICIAL build. If you want the OFFICIAL LineageOS update or some more Android Oreo ROMs then stay tuned to the LineageOS 15 Android Oreo page or the AOSP Android Oreo devices list page. This LineageOS 15.1 for HTC 10 (pme) is brought to you by developer fagyi. THIS IS AN INITIAL BUILD WHICH HAS MANY BUGS. HAVE A BACKUP BEFORE FLASHING THIS ROM AND TRY AT YOUR OWN RISK. Installing a custom ROM on a HTC 10 (pme) requires the bootloader to be unlocked on the HTC 10 (pme) phone, which may VOID your warranty and may delete all your data. Before proceeding further you may consider backup all data on the phone. You are the only person doing changes to your phone and I cannot be held responsible for the mistakes done by you. – Here is theTWRP update guide for the HTC 10. This TWRP recovery guide requires an unlocked bootloader on the HTC 10. Download and Copy the Oreo GApps and HTC 10 LineageOS 15.1 ROM ZIP to your phone. First flash the HTC 10 LineageOS 15.1 ROM ZIP from device. Then flash the GApps zip from your device memory. Reboot and Enjoy the Oreo 8.1 LineageOS 15.1 ROM for HTC 10. Copy the latest HTC 10 LineageOS 15.1 ROM ZIP file to your phone. Stay tuned or Subscribe to the HTC 10 (pme) forum For other Android Oreo, Nougat ROMs, LineageOS 15.1 ROMs, other ROMs and all other device specific topics. i’ve been testing the for like a month, and i have two problems, dual speaker won’t work and camera is to slow it takes a lot to open, i dont know if i have this problem cause i have oreo firmware, but by the way its a quite nice rom. Great ROM, everything works good except a few things, indeed only 1 speaker plays audio, camera apps start a bit slow, and HTC Sense (among some other HTC Apps) seems to crash and stop working, but that last part might be because of some conflict with GApps. I request advise. Installed LineageOS 15 on HTC 10, together with Gapps and ICE sound kernel from the hub. As far as sound quality it’s the best I’ve heard from any custom ROM so far. My problem is when making calls I can hear the caller from both the internal and external speakers. Have gone through every forum concerning LineageOS about this issue but came up with nothing. You can try without flashing the ICE sound kernel and see if you still see the problem that you have reported!